Your right to privacy is important to us. CM believes that the personal information you choose to furnish online or otherwise should be used to help us to provide you with the highest quality service and support possible. If you contact us, we will collect such personally identifiable information as you provide. Our registration forms require users to give us contact information that may include name, e-mail address, address, interests, and similar information. We do not request or store sensitive information from our visitors, such as credit card or social security numbers. CM may collect IP addresses and website usage information from you when you visit our websites. This information helps us evaluate how our visitors and subscribers use and navigate our websites on an aggregated basis, including the number and frequency of visitors to each webpage, and the length of their visits. When you view our website, we may store some information on your computer. This information will be in the form of a “cookie” or similar file. Cookies are alphanumeric identifiers that are transferred to your computer’s hard drive through your Internet browser. Cookies enable the website to recognize your browser and to remember your account information and password information when you visit the web site and to tailor our website to better match your interests and preferences. They also make shopping online more convenient for you, for example, by allowing us to store items in your shopping basket between visits. With most Internet browsers, you can erase cookies from your computer hard drive, block all cookies or receive a warning before a cookie is stored. Please refer to your browser instructions or help screen to learn more about these functions. If you choose not to accept cookies, you should be aware that you may not be able to experience the full functionality of the website. CM may provide you with the opportunity to participate in online surveys. If you choose to participate, we may request certain personally identifiable information. Participation in these surveys is entirely voluntary. You, therefore, have a choice whether or not to disclose this information. The requested information typically includes contact information (such as name and mailing address) and demographic information (such as zip code and job title). If you wish to subscribe to any of CM’s e-mail news services or information on products, services, promotions or special events, we will use your name and e-mail address to send them to you. In the interest of maintaining your privacy, we provide a means by which you may “unsubscribe” or choose not to receive future messages from us. At the bottom of each e-mail you have the option to “opt-out” of our e-mailing list. CM shares aggregated demographic information about our user base with our partners and advertisers. This information does not identify individual users and is used primarily to monitor the performance of campaigns contracted by our partners and advertisers. We do not link aggregate user data with personally identifiable information. Notwithstanding the preceding, CM may sell or rent to a third party a listing of our users who have subscribed, purchased or registered for one or more our products. This listing may include (without limitation): names, addresses, phone numbers, and e-mail addresses. If, at any time, you wish to be excluded from this list, you may notify us and we will suppress your name from all such lists and practices. We take appropriate steps to protect all information you share with us. All personal and purchase information is protected by a secured network accessible only to our Webmaster and Customer Care Department. Your credit card information is protected during an online purchase transaction by secure server software (SSL). Your credit card number is encrypted with only the last four digits of your card number visible or accessible to our Webmaster and Customer Care Department. You may stop the delivery of one or all types of communications you receive from CM by following the instructions in the e-mail you receive. Counselor magazine reserves the right to provide your information to appropriate authorities if we believe in good faith that the law requires it or to protect our legal rights or our property. As we continue to develop our business, we may buy or sell business assets. In such transactions, customer information is generally one of the transferred business assets. Accordingly, you can expect that if we were to sell Counselor magazine, your information would be part of the assets transferred in such sale. This policy was last updated on May 10, 2018.. Counselor Magazine is the official publication of the California Association of Addiction Programs and Professionals (CCAPP). 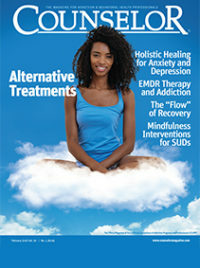 Counselor offers online continuing education, article archives, subscription deals, and article submission guidelines. It has been serving the addiction field for more than thirty years. For more information on CCAPP’s many programs, certifications, and career paths, please visit ccapp.us.